In the broadest definition of the term, 3D would describe any object that occurs on a three-axis Cartesian coordinate system. If that sounds a tad technical, fear not — we'll clear it up right away. A Cartesian coordinate system is basically a fancy way of describing the X and Y axes we're all familiar with from high-school geometry (think graph paper). You remember making little graphs and charts with the X axis being horizontal, and the Y-axis being vertical, right? Things are very much the same in the world of 3D, with one exception – there's a third axis: Z, which represents depth. So by definition, any object that can be represented on a three-axis system is 3D. But, that isn't the whole story, of course. Chances are you're reading this because you have at least a passing interest in 3D as it's referred to in the computer graphics industry, which includes film, television, advertising, engineering, and video game development. 3D Models: Any representation of an object in digital space, is called a 3D model. If you took a look at the raw information that comprises a basic 3D model, it would simply (or not so simply) be a collection of data points that mark thousands or millions of different coordinates in Cartesian space. The software does the math: Luckily for artists, 3D software deals with most of the difficult mathematics. Within the graphical user interface of a 3D software package like Autodesk 3ds Max or Maya, 3D models are automatically interpreted and visually represented as geometric objects made up of edges, vertices, and polygonal faces. 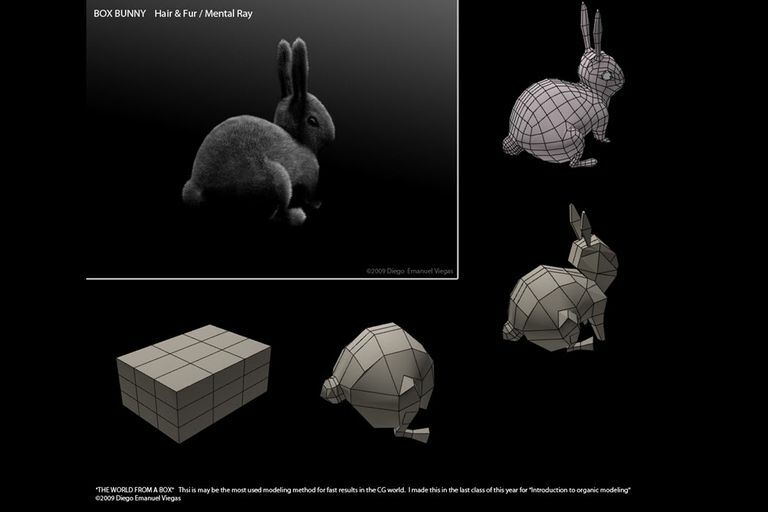 Most software environments have built-in real-time render engines capable of displaying 3D models with semi-realistic lighting, shadows, and textures. The depth of an object in terms of size. As in, 5 units wide, 4 units tall, and 3 units deep. The location of an object in relation to the origin. The origin in any 3D scene is (0,0,0) with the third number usually being "Z". There are a few smaller 3D packages that use Z as the vertical axis, but these cases are rare. The distance of an object from the rendered camera, known in computer graphics as z-depth. Z-Depth is often used to apply depth of field effects in post-production, and in video games, it's used for level of detail optimizations. The Z-axis of rotation. For example, a ball rolling away from a camera would be said to be rotating along the negative Z-axis. The word 3D means something entirely different when used in reference to 3D movies (the kind that require you to wear glasses and make you want to reach out and try to touch the things popping out of the screen). 3D films can, and often do, have an aspect of 3D computer graphics, however, there are plenty of traditionally shot, non-CG films that have taken advantage of the recent resurgence of 3D cinema. The defining characteristic of 3D as we think about it at the movie theater (and now in the home theater), is that the filmmakers must use some means to trick the human visual system into an illusory perception of depth. Binocular Disparity: The key to human depth perception has everything to do with the fact that our eyes each send a slightly different image to the brain. Our brain derives a perception of distance by interpreting the difference in the image from the left and right eye. This is known as binocular disparity. Stereoscopy: To create the illusion of depth, filmmakers have had to develop ways to mimic binocular disparity. The common means for achieving this is to use dual or alternating projection systems in conjunction with polarized glasses that ensure that the left and right eye always receive a slightly different image. This is known as stereoscopy, hence the term stereoscopic 3D. Hopefully, by this point, you're a little bit more knowledgeable about 3D as it relates to computer graphics and film. We've interspersed some links in the body of this article, which explain some of the concepts presented in greater depth.